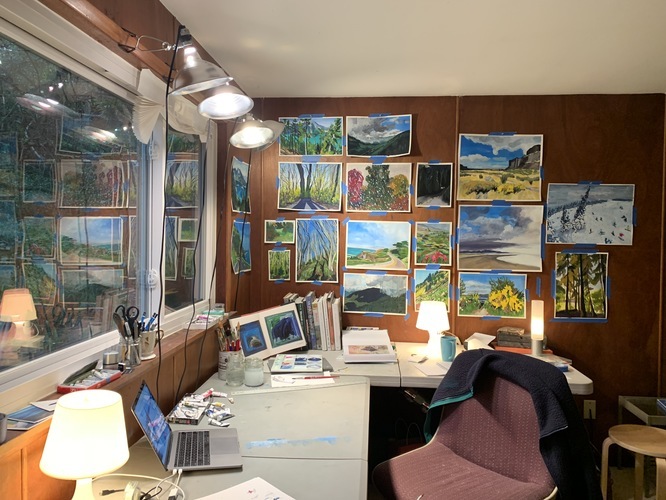 My paintings act as a diary of sorts, a recording of the places I have seen, the moments that I have found to be so beautiful, they demand to be recorded. Working with gouache on paper has afforded the ability to work small, fast and loose, to capture the gesture of the memory. My work is often made in one sitting; using a combination of reference photos, drawings and my memory. It is my hope that the viewer can emotionally connect the work with their own remembered experiences or their aspirational experiences. The work represents landscapes that are found within the Seattle city limits, some of which are part of my day to day life, as well as the joys of exploring the surrounding landscapes farther afield. I aim to capture the moments that make me stop in my tracks, and just look at the vista, the light coming through the trees— the natural beauty of the moment. It aims to capture the feeling of that moment. In essence I want that feeling to live forever. I studied painting at Tyler School of Art in Philadelphia, Pennsylvainia and in Rome, Italy. I currently reside in Seattle, WA.